This edition of the 3 Questions For Small Business Podcast features Steve Saunders from Tempo Air and TexEnergy Solutions. Steve gives background on the spin off of Tempo Air from TD Industries, using an ESOP. Next, Steve addresses how Tempo has responded to the contraction of the new construction market by addressing home energy. Finally, Steve offers his projections for the future direction of the air conditioning industry. "Is it open?" my daughter asked when we found it. It was a particular restaurant my wife had read a good review about. A glance through the windows revealed a number of set tables, but no one inside. This was a far cry from the hustle and bustle of take-out and counter places one block over. My family hesitated to walk in. "Well," I said, "The sign says it's open from 11:00 to 11:00. Let's go in." We gathered at the entrance and waited for a man in the far corner to notice us and offer seating. He was hunched over a newspaper muttering to himself. "Excuse me," my wife half-shouted. "Are you open?" Startled, he sprang to his feet. "Yes, yes, we're open," he said in heavily accented English. "How many in party?" "Party of four," I answered. "Here, sit by window," the waiter said, direcing us to the one table where everyone could look out the window. We were the only people in the restaurant, which doesn't usually bode well. "The locals are supposed to frequent this restaurant," my wife said. "I guess there's all still shopping." "It's four in the afternoon," my oldest daughter pointed out. "It's too late for lunch and too early for dinner. That's why no one's here." Whatever the reason for the scarcity of clientele, the food was excellent. As I watched people pass by on the sidewalk, I asked my family, "Why do you think he seated us by the window?" "Is this another one of your dumb jokes?" asked my youngest. Everyone looked at me accusingly. "No seriously," I said, "Why are we seated at the window? It's not that the waiter was being nice." Clearly no one was going to reply, so I answered my own question. "It's to make the restaurant look like there's people here. Seeing people in the window draws others." They got it. They remembered the hesitancy they felt when we walked up to an empty restaurant. For most people, the only thing worse than a restaurant with long lines is a restaurant with empty tables. We all tend to be herd-like or tribe-like. Most people don't want to be the first to try something. It's why we prefer to patronize popular businesses or seek companies that have been highly recommended. Absent the good review and we may not have walked through the doors of the empty restaurant. The waiter knew this. He knew that people drew more people, which is why we were seated at the window. So what about your business? How can you seat people at the window? How can you seat people at the window if your business doesn't really have a window? Include lots of customer testimonials on your website. 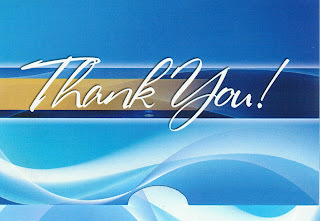 It's amazing to me how many times I walk into a contractor's business and see glowing testimonials framed on the wall. These are often inspirational to read and suggest this is the type of company anyone would want to do business with. So why aren't they on the website where other potential customers might read them? Why aren't they seated in the window? Use yard signs. Don't limit the use of yard signs to major jobs. Use them on every service call. A growing number of companies are following the lead of Hal Smith from Halco in Rochester, NY and are "paying people" to rent their yards for a month after every service call. At the conclusion of the call, the Halco plumber or technician asks the homeowner if he would like to take another $10 off the final invoice by renting his yard for a month. The plumber then explains to the curious homeowner that he can save another $10 by allow Halco to leave a yard sign in his yard for a month. If the homeowner agrees, the plumber earns a $5 spiff. Most do. For $18 a customer ($10 discount + $5 spiff + $3 disposable yard sign), Halco is seating people at the window. Create a Facebook fan page for your company. When your customers become fans of your Facebook page, they are seating themselves at the window of your company. Encourage Facebook fans by making special offers and providing unique news to your company's Facebook fans. Seat people at the window. Some of the most memorable lessons I had as a kid came from stories. Who doesn't remember the lesson that "slow and steady winning the race" from the Tortoise and the Hare? I bet you have similar lessons you remember from Aesop, Uncle Remus, and the Bible. Of course, that's just kid stuff. Right? Maybe not. When I was working as a manufacturing engineer, I was given a copy of "The Goal" by Eliyahu M. Goldratt and Jeff Cox. The book presented the Theory of Constraints, not exactly the most exciting of concepts. Yet, I read the book from cover to cover in one sitting. It wasn't the concept that kept me riveted, but the story. "The Goal" was written as a novel. It turns out that millions of people liked the format. A book about a manufacturing concept sold millions of copies. I've noticed a lot of well selling books use the form of a narrative, including "The Richest Man in Babylon," "The Wealthy Barber," "Rich Dad, Poor Dad," "The Greatest Salesman in the World," most Ken Blanchard books, and the books ("Freedom From Fear" and "A Simple Choice") by my friend, Mark Matteson. People like to read stories. This is why fiction outsells non-fiction. Erika Holzer wrote the following about Ayn Rand in a blog about the resurgence of the great book, "Atlas Shrugged." If you want to write to be read, write stories. If you want your lessons to your team to be remembered, use stories and parables to make them more memorable. The way Jesus taught a couple of thousand years ago still works. An HVAC contractor who found himself picking up a homeless man on a Christmas Eve, on the way to a no-heat call. It's a sappy, feel-good, tear jerker type of story... just perfect for Christmas. You check with the International Ice Cream Association and discover that the number one flavor is vanilla. 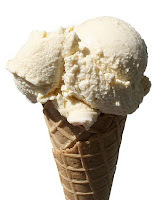 In fact, vanilla is preferred by more than a three to one margin over the number two flavor. Okay, that’s it. You’re going to promote vanilla. You’re going to paint, “Vanilla ice cream here!” on the window of your storefront. You’re going to devote your yellow pages ad to the theme, “We’ve got vanilla!” Everywhere you can, you’re going to trumpet your vanilla ice cream. You’re going to go out of business. The Service Roundtable is the best thing coming down the pike. What a "bang for your buck." "People who belong to the Service Roundtable are miles ahead of the rest of the herd, there is no better value for your dollar in our industry." Take Gene's advice. Check out the Service Roundtable or contact Liz Patrick or Janet Thomasson and request a free tour. The "3 Questions For Small Business Podcast" continues with Dave Rothacker from The Technician Shop and Rothacker Reviews. Dave addresses the evolution of the Internet, the use of social media to help a small business grow, and his recommended books for business owners and managers. 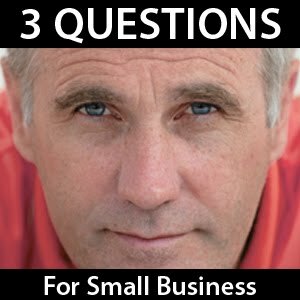 Announcing the "3 Questions For Small Business Podcast"
We're starting a new podcast series, entitled "3 Questions For Small Business." Each edition will feature a business leader who will answer three questions about himself or herself, his or her company, or business in general. This first edition features Michael Bohinc from Keeping Score CPA. Michael offers year end tax planning strategies for small businesses and individuals. He also offers his insight on ways companies can improve their financial performance. The Service Roundtable is it. This is the place the best practices groups get their ideas. For a contractor to be in business and not use Service Roundtable's resources would be like a fisherman not using a boat, motor, gas, rod, reel, line, hooks, bait or a net. Better to ask a friend to give you a fish. Thanks guys! You made me blush. 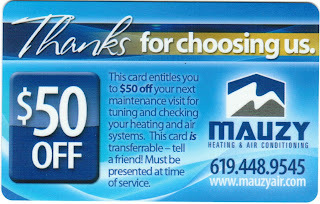 Matt Mauzy from Mauzy Heating & Air Conditioning in San Diego shared the gift card program he uses with new customers and gave me permission to write about it. This is the front of the gift presentation folder. This is the back of the gift folder. This is the open folder. 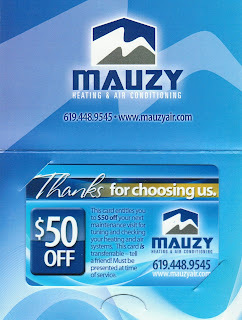 The front of the card with a $50 bounce back coupon. Note that the card is "transferrable." It can be given to a friend. 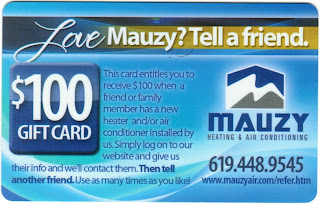 The back of the card is the referral program. Note how the customer is directed to enter the information online, generating a referral lead. If you do not want to go to the trouble and expense of creating a gift card, but like the concept, create a business card version. Note: I wrote this for Southern PHC Magazine and would normally link to it, but the article is not online, so I'm reprinting here. As consumer yellow page usage wanes, local Internet search is becoming more important. Search for “air conditioning” and based on your IP address, search engines like Google will serve up local companies, including a map with locations. You want your company on this map. Putting your company on Google Maps, which is Google’s local search, is simple. Visit http://local.google.com/ and click on “Put your business on Google Maps.” You will need to create a Google account, but that only takes seconds. Your company may already be listed. If it is, Google will prompt you to claim it. Fill out all information on your company. Make sure you incorporate product, service, and brand search terms. Google verifies all local business listings. You can choose phone or postal mail. Pick the phone method. It’s faster. Internet Directories – Get listed on every Internet yellow pages and business directory you can find. This includes the chamber of commerce, city directories, the Better Business Bureau, trade association directories, manufacturer dealer locators, NATE’s Consumer to Contractor Connection, InfoUSA’s database, Yahoo, Bing, DMOZ and other search directories, etc. Keyword in Business Name – Including the right search term in your company name can make the difference between being ranked #4 and #1. Make sure you include “heating and air conditioning” in your listing. Customer Reviews – If you increase the number of customer reviews, you will increase your ranking. Ask your customers to review your company on Google. Use a review guide like the one shown to encourage customers to complete the review. 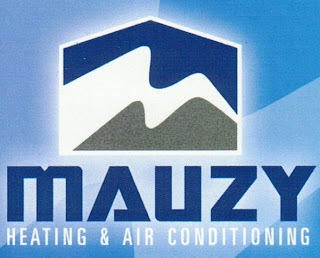 You can download this review by clicking on “Free Stuff” at www.ServiceRoundtable.com. Social Media – Create a Facebook fan page that links back to your website. Create Linked In and Plaxo profiles with links to your website. Full Address – Make sure your website contains your full address, preferably on the front page. Toll Free Phone Number – You should avoid using the exclusive use of a toll free phone number on your website. Local businesses should have local numbers according to search engine ranking logic. P.O. Box – Do not rely solely on a post office box. Add your physical address as a shipping address. Multiple Addresses – Limit yourself to one address on your website. Multiple addresses tends to confuse the search engines. Why Google? According to comScore, Google not only commands 64% of all domestic Internet searches, but its share is rising. The volume of searching is increasing and Google is taking 90% of the increase. Last year, 85 billion searches were performed in the United States using Google. Do not ignore the other search engines. Many people still use them. But more use Google than all others combined. Putting yourself on the (Google) map only takes a few minutes. Spend a few more to boost your ranking and you will find your incoming call volume increasing without spending another dime. Think you have customer service issues? Try running a fast food franchise where the customer calls 911 seeking protection from the wrong cheeseburger. When I talk about the need to fire a customer every now and then, this is the customer you should fire. David and I called a cab to take us from a business meeting to the hotel. At the very instant the cab pulled up, the meeting got interesting. We kept the cabbie waiting for a few minutes while we wrapped up and apologized when we loaded our luggage into the cab. The cab driver didn't seem to mind, though he did say that the dispatcher was getting itchy. The cab ride was short. It was only a couple of miles. We were recapping the meeting for most of the trip. When we finished, the cab driver engaged us in the usual type of cab conversation. Where are you from? Why are you here? At the hotel, the cabbie discovered that his meter hadn't reset from his last fare. It's going to be about $10, he said, but he has to get a supervisor to give him the fare amount. He worked the radio while we waited in the back seat. The supervisor wasn't readily available. The cabbie was clearly embarrassed about the wait and offered several apologies, which we brushed off. "We made you wait," I told him. "It's okay for you to make us wait." A few minutes later, David offered the same comment. The supervisor finally returned. The fare was $10.30. David paid $20. The next morning we needed a cab to go from the hotel to the office. There wasn't a hotel bellman working the cab stand and we wanted a cab with a credit card terminal, so we walked down the line of cabs to find one. The first cab with a terminal was eight cabs back. We shortened the cabbie's wait by pulling him out of line. His only comment was to grumble that we weren't going a long way. He said it again before we got out of the parking lot. "Yeah, you said that already," barked David in a clear signal that his tip was at risk if he continued to gripe. He did. He griped that individual cabbies couldn't buy a medallion and that the cab drivers didn't stick together like they did in other cities. "This is my home," snarled the cabbie. So far, we'd travelled about a block. The cabbie commented again that we weren't going very far. He noted that there was a hotel much closer to the address we were going to and we could walk across the street from that hotel. Not quite. And with our luggage, we would've called a cab from that hotel too. The cabbie informed us that a medallion cost $300,000 in New York and stated his belief that two people driving a cab over two shifts could each make $50,000 per year and pay it off in three years. I could be wrong, but I think he overlooked living expenses and pay for the second driver. I didn't ask about it. He asked where we were from. David told him Dallas. He said, "Figures. You can always tell the ones from Dallas." "People from Dallas and Houston. They're different. You can tell." Just before we arrived at our destination, the cab driver must have realized he was shooting himself in the foot. He started talking about the beauty of the sunrise and took a picture of it. When we arrived, the total on the meter was a little less than $10. David paid the exact amount. You couldn't ask for a different experience. The first cab driver underperformed the technical aspects of the job. He messed up the meter, which required us to wait while a supervisor gave him the fare. The final fare, based on the supervisor's estimate, was higher than the metered fare the next morning. The first cabbie overcharged us. By contrast, he second cab driver was technically perfect and accurately priced. Yet, the first cabbie clearly outperformed the second. When tips were included, he was voluntarily given double the fare. If given a choice between walking and enduring another ride with the second cabbie, I would seriously consider walking, luggage and all, which is how some homeowners feel about home service companies. With cabs and contracting, the distinguishing feature of the service is not the technical differences or even price. It's the interpersonal differences. Technical proficiency is not enough. Offering a better price is not enough. Good human relationship skills are also required. Simply being a nice guy can overcome a technical miscue and allow you to charge more. The other day I saw a plumbing service truck decorated with garland wrapped around the antenna and a lighted Christmas wreath attached to the front of the grille. It flashed by in an instant and I wasn't able to snap a picture of it, but I thought it was a great idea to decorate a service truck for Christmas. It would be distinctive. It would draw the eye. It would make people smile. Making people smile when they see your brand is always a good thing. Alas, there was no picture. So I searched online for an example. 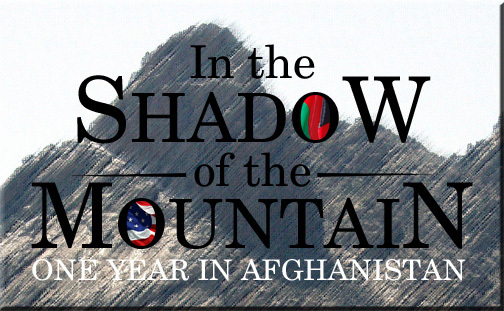 When I clicked the picture, I stumbled onto In the Shadow of the Mountain - One Year in Afghanistan, the blog of a Public Affairs Officer with the U.S. Air Force, serving in Afghanistan. 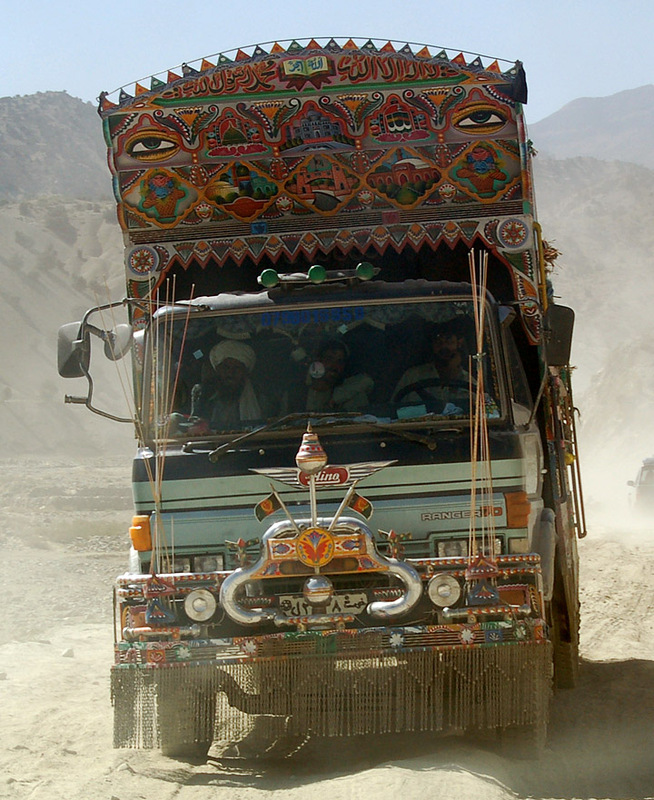 The blog covers a full year in-country over 2007. The writer has good communications skills and likes photography. While every post isn't open to the public, most are. It's a well-told, first-hand account of service in Afghanistan, written for family and friends, but read by a wider audience. I started reading it and was fascinated. I read post after post from my starting point. When I got to the end, I started at the beginning and read the posts I missed by starting in the middle. Why was this blog so interesting? Part of it, of course, is that we're at war in Afghanistan and I really don't know a whole lot about the country. There's more to it than that. The blog is interesting because it's authentic. A human wrote it, not a corporate or agency automaton. It's conversational. It tells a story. It informs. After reading the blog, I feel like I know Air Force Captain John Severns. You can create a similar blog for your business. 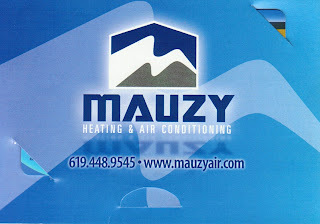 While you might think plumbing, air conditioning, electrical, pool service, pest control, carpet cleaning, etc. is uninteresting, I'll bet you can find lots of interesting experiences to write about. Start with some of the things your service people encounter on a day to day basis. For example, the plumber pulls a really bad anode rod. He takes a picture of it next to a new one and explains the importance of the anode. The air conditioning technician pulls a really bad filter from a unit, takes a picture of it and explains about replacing filters. The electrician grabs lunch at a new restaurant, takes a picture, and offers a quick review (though it should be positive or omitted - you don't want enemies). A pool contractor drives by a group of protesters and snaps a shot, writing about what he saw. 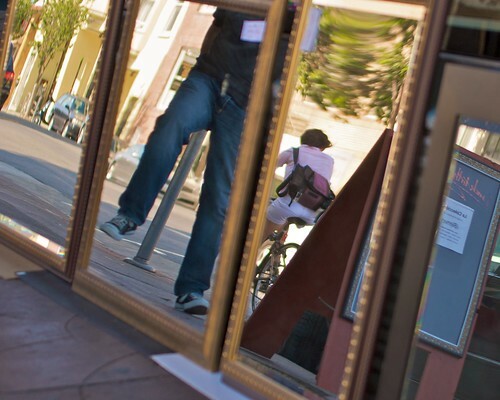 Service company employees encounter blog worthy items every day. Speak with your human voice. Have a conversation with your customers. Spread the word. Tweet about your blogs. Post links on Facebook. Engage people. Build your business. As the holidays & end of the year fast approach, I’m going to ask you to take a few minutes to review your tax situation for 2009 to see if some of the following ideas may save you some money on your taxes come next spring. As with everything else, you need to consult your own CPA or tax advisor for advice specific to your situation. This post only covers a portion of possible opportunities that may be available to you and there are also some hurdles (like the Alternative Minimum Tax) that may trip you up & keep you from being able to use some of these suggestions. Also, the clock is ticking REALLY fast as some of these opportunities expire on December 31, 2009. Traditionally, the typical year end tax strategy is to defer income into next year and accelerate deductible expenses into this year. This is done to defer paying income taxes. Think of it as kicking the “tax” can further down the street. This holds true in years where you expect to be in the same or lower tax bracket the following year. If you expect the opposite to be true (higher tax bracket), then accelerate income and postpone deductible expenses. This way more income is taxed at a lower rate. Currently, tax rates for 2011 will be going up for the high-end tax brackets as the Bush tax cuts are allowed to expire. With the programs that the current administration has on its’ agenda to implement, I do not see how they can keep from raising the tax rates on the middle class in 2011 as well. These are just some of the deductions and credits available. You have until December 31, 2009. Talk to your CPA or tax advisor to discuss your specific situation. Whenever I take shirts to my cleaners, the cleaners replaces any missing or broken buttons. Your cleaners probably does the same, but do you know about it? The reason I'm aware is the cleaners sticks a small tag through the matching button hole and staples it. The tag declares, "Replaced Button." The tag is a reminder of a small added value the cleaners provides. Without the tag, I might forget about there was a button missing or even be aware of it. The cleaners won't get extra credit if I don't know about it. Hence, the tag. I bet there are little things that you do for your customers they are unaware of. A plumber might clean a faucet aerator. An HVAC technician might notice the time on a digital thermostat is off an hour due to a change in daylight savings time and set the time correctly. An electrician might casually test a GFCI outlet. A pool technician might cut out a small section of pool sweep hose where it's leaking. Whatever the action, you won't get credit if you don't tell the customer what was done. Note it on the invoice and write, "No charge." And don't just note it. Tell the customer too. Think of the impact if the cleaners employee told me that three buttons were found missing and were replaced at the time I picked up my shirts. When you do a good deed, even if it's part of the routine, don't keep it a secret. How do you give 100% in life? It's not merely hard work. All of us know people who work hard their entire lives without ever achieving much. Hard work may get you most of the way there, but there must be something more. Certainly knowledge is important. I can think of many times in my life where I worked hard, but not smart. I didn't know better ways to get something done. Once someone showed me a better way, I was able to get more done for the same amount of effort. However, even knowledge and hard work is not sufficient. Together, they can get you close to 100%, but something's still missing. What's missing is attitude. Without the right attitude, you'll never give 100% in life. And you'll never receive life's full bounty in return. Now, we assign the values to each letter in the words hard work, knowledge, and attitude. 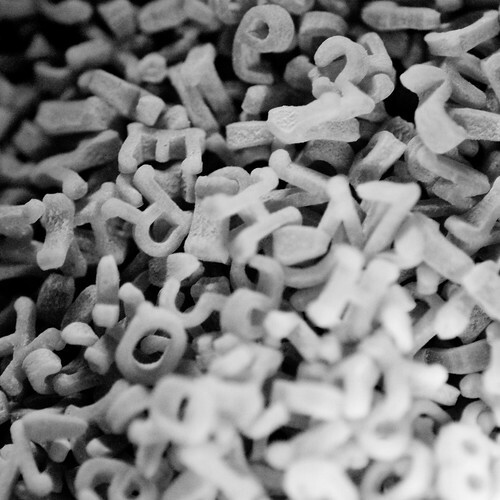 Finally, add up the numeric totals for each word and divide by 100. Hardwork = 96%. Knowledge = 98%. Attitude = 100%. Sure, it's a mere coincidence, but it illustrates the point well. Hard work gets you close. Knowledge gets you closer. But you'll never give or receive 100% without the right attitude. My buddy Bubba is a pretty good fisherman. He rarely has a dry haul. He could probably be a professional guide. No, he should be a professional guide, because he’s not much of a businessperson. I wonder what kind of fisherman he’d be if he fished the way he runs his business. What shape should is right for a logo? Marketing expert Al Ries suggests a ratio of 1 X 2-1/4. Have you ever just clicked with a prospect? Everything worked from the minute you met. It was an easy sale. More than likely, you and the prospect share similar social styles. You have natural rapport. You click. It's great when you benefit from automatic rapport. Too bad it only happens around one time in four. Most of the time, your social style conflicts with the prospect's. When your style conflicts with the prospect, you don't click. Yes, you can still make a sale, but it's more difficult. In fact, when the salesperson's social style is in direct conflict with the prospect's style, the sale is made in spite of, not because of the salesperson's efforts. So what can you do? Well, one simple technique is mirroring. Match the prospect's verbal tone and pacing. Match the body language. If the prospect leans back, you lean back and vice versa. Be careful not to mirror so closely that you mimic the prospect. If noticed, mimicking can be perceived as an insult. Frankly, it's uncomfortable to mirror a prospect. It's counter to your natural social style, but it improves your focus on the prospect and helps the prospect become more comfortable. Give it a try. Have you ever walked down the street and noticed a $20 bill lying on the sidewalk? If you did, I bet you picked it up. Maybe you looked around to see if someone had just dropped it, but if it was free and clear, you picked it up. It's free money. Who wouldn't pick it up? Apparently a lot of people. One of the most painless ways to cut expenses is to cut the cost of money. Given current interest rates, this is a great time to call your banker to renegotiate your building mortgage interest rates. If you rent and there are commercial vacancies in your area, see if you can get a break on lease rates. If the landlord isn't willing to work with you, check into the possibility of new space elsewhere, at more competitive rates, once your lease is up. Due to impending legislation on credit card interest rates, many card issuers are raising rates dramatically because they may not be able to down the road. If you have an unpaid balance, check into lowering your rate by transferring it to a new card or rolling it into other debt. If you pay expenses by check today, consider paying bills with credit cards that have a cash back or airline mileage provision. 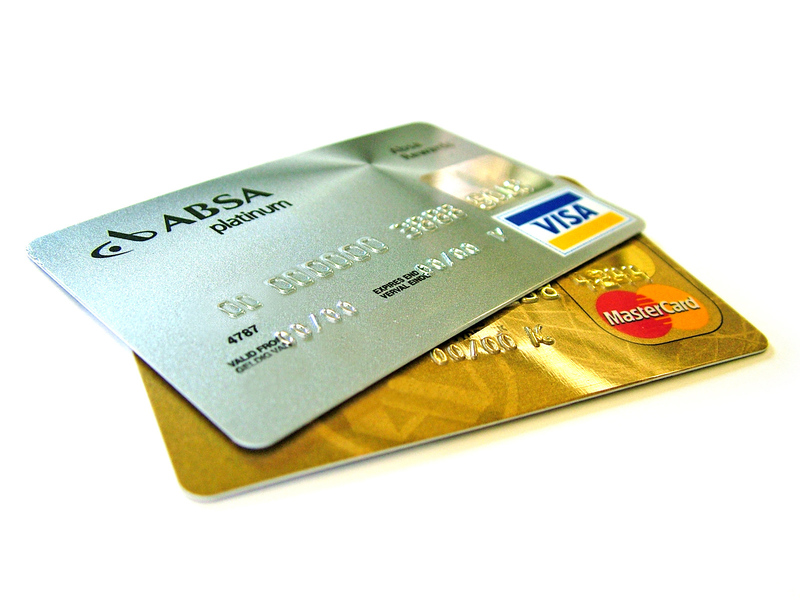 If your supply house doesn't take credit cards, consider switching to another that does. Since the credit card gives you a 30-day float, make sure you pay vendors within 10-days to take advantage of discounts. Make sure you're utilizing frequent purchaser programs from office supply stores. Every few months, we receive a gift card from Office Depot based on the previous months' purchases. It's not a huge amount, but it adds up and we earn it simply by remembering a phone number when we make a purchase. Some retailers offer corporate discounts for the asking. Barnes & Noble will gladly sell you a Reader's Advantage card for $25, but the also offer a corporate card for free that gives you 15% off book purchases. Recently, I replaced my laptop battery at Batteries Plus. Because I told them I was replacing it as a business purchase, I got a small discount. If you're eligible for buying programs like the Service Roundtable's Roundtable Rewards program, be sure to enroll and take advantage of the savings. Another area to save is merchant services. Many business owners pay far to much in rates and the myriad of small fees. A different merchant services vendor can save thousands. I have good news for you, but bad news for me - Unfortunately, you are currently getting the best deal we've seen in a long time. You are getting all pass through plus 10 basis points. Look in the Discount % column where it says .10%. Then, we looked at all the interchange breakdowns on the 2nd page and all of the interchange categories are correct and you are getting your business cards at Level II which is rare. Cleanest and cheapest statement we've seen in a while. Best we could do is match what you are getting and if what you have now is working, then it would not make sense to switch. Contractors using the Service Roundtable's program literally save thousands vis-a-vis their old program. Every dollar falls straight to the bottom line. Why in the world wouldn't a contractor jump at the chance to painlessly save money? Why would anyone walk past a $20 bill lying on the sidewalk? If you figure it out, let me know. If you're a Service Roundtable member and want to save painlessly through Roundtable Rewards or the merchant services program, contact Janet Thomasson. One of the people Hill met and studied was Thomas Edison. No one illustrates the value of persistence and tenacity better than Edison. Many people know that Edison failed 2,000 times in his effort to find the filament for the light bulb. But did you know his attempt to create a better battery resulted in the failure of 50,000 tests? A discouraged assistant figured even Edison would quit after 50,000 failures. “You must be pretty downhearted with the lack of progress,” said the assistant. Edison’s kept at it, through 50,000 failed tests, through ten years, and through one million dollars of his own money until he developed the nickel-iron alkaline storage battery, which is still used today! Maybe you don’t have Edison’s tenacity. I know I don’t. Yet, when I think about Edison, I find I have just a little bit more tenacity. Edison inspires me. Edison helps me see failure in a different light. It’s not failure. It’s progress. Edison helps me to stay positive while I’m making progress. “Don’t Quit” is an inspirational poem many people have read that may have been written about Edison. Though many claim to have written the poem, its author is lost. For a nice winter wallpaper featuring the poem, “Don’t Quit” to boost your attitude and tenacity, click here to visit the "Free Stuff" section of the Service Roundtable. Playing football, Vinnie managed to attend a local college. Academically, little changed. Vinnie began reading voraciously. He read book after book, but gravitated towards Tom Clancy type action thrillers. It wasn’t just books. He could watch a few minutes of a TV drama and anticipate the ending. He could foresee actual events in the real world years in advance. Vinnie earned his degree and took a sales and marketing job with Kraft General Foods. He did well, but felt stifled in corporate America. He quit his highly paid position to become a Marine pilot. Unfortunately, Vinnie was medically disqualified for the flight program. He eventually got a medical waiver and left the Corps. Now what? The dyslexic Vinnie decided he wanted to write a novel and took a job tending bar to pay the bills. He finished the novel and sent it off to New York publishing houses, but it was rejected. And rejected. And rejected. And yet, it wasn’t easy. “There were moments when I was bar tending at O'Gara's and I would get another rejection letter and I'd think what am I doing. Why am I doing this?” he confessed. Vinnie self published his book. People told him he was crazy, but had a plan. He was going to sell enough books in his market to catch the attention of a New York publisher. “Anybody who knew me growing up calls me Vinnie,” says best selling author Vince Flynn. His first book, the one he self published, is titled “Term Limits.” I’ve read it. It’s a page turner. One after another, Flynn's books are successes. He's popular with kings and presidents. Flynn's been invited to the White House by Presidents Clinton and Bush. He was flown to Jordan by King Abdullah, who is also a fan. Not bad for the guy who wrote the worst paper a college professor read in 10 years of teaching. Cursed with dyslexia, Flynn realized it gave him a different set of capabilities. It enabled him, for example, to write about a terrorist attack on the United States by Islamic radicals four years before 9/11. Today he sees the curse as a gift. Flynn’s story is one of looking at a disability as a different ability, at a curse as a gift when viewed from another perspective, and at obstacles as challenges to be overcome. Had life been easier, he might not have climbed so high.